The small population of the Saunders’s Gull Saundersilarus saundersi is declining due to habitat loss including insufficient nesting area, vegetation change, decreasing feeding area, predation and human disturbance. The population is estimated at 14,400 mature individuals and it is therefore listed as Vulnerable under the IUCN Red List. Saunders’s Gulls nest on the ground and are restricted to Common Seepweed Suaeda glaucasaltmarsh habitats. They winter on estuarine tidal flats with regular movements between different sites depending on weather and food supply. 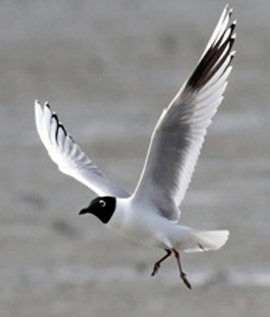 Saunders’s Gulls breed in eastern mainland China and in South Korea (only in Songdo, Incheon on the west coast). In China, the key breeding sites are Shuangtai Hekouin Liaoning (1,317 birds, 2001), Yellow River Delta in Shandong (801 adults 2007) and Yanchengin Jiangsu (575 adults). In South Korea, the current breeding population of Saunders’s Gull is 50 pairs, but up to 400 individuals were observed at south Yeongjong-do and Songdo in May 2013.Some birds may breed in North Korea. They winter in eastern and southern China (9,625 birds), Hong Kong (35), Macau, Taiwan (700), along the western and southern coast of South Korea (450), in south-western Japan (2,000) and Vietnam (10). The coast of Dandong is an important stopover site on the flyway of Panjin-Japan, with 232 adults sighted in April 2008, 75% of which were adults in their first winter. The key wintering grounds are Bohai Bay (864 in 2005/2006), Wenzhou-Yueqing bays, Guangdong and Guangxi in China and Suncheon-Kwangyang bays (750,Geum River estuary in 2004) in South Korea. The key threat is reclamation of tidal flats and saltmarshes, particularly in China, South Korea and Japan. Over 20 years, many former breeding sites on tidal flats and saltmarshes in China and South Korea have disappeared due to reclamation and construction. Common Seepweed, the breeding habitat of Saunders’s Gull has decreased by nearly 80% at Yancheng National Nature Reserve over the last 15 years because of conversion to aquaculture ponds. In 2011, many chicks and eggs at a breeding colony in Panjin were lost to rising water levels associated with land conversion to aquaculture ponds. This is also a potential threat to other colonies. The introduction of Smooth Cordgrass Spartina alterniflora in 1982 has also caused considerable habitat degradation by replacing Common Seepweed. The area covered by Cordgrass has tripled in the last 15 years. The other two breeding sites in China, Shuangtai Hekou and the Yellow River delta, are major oilfields and birds are threatened by pollution and human activities. Reclamation developments associated with the Tianjin New Coastal District project had seriously impacted an important wintering area and caused a substantial loss of inter-tidal mudflats in Tianjin city in 2011. Disturbance of nest-sites is a problem, particularly through the collection of lugworms on tidal flats in China, and by photographers in South Korea. The disturbance of adults increased predation of eggs and chicks. Sometimes, eggs are collected by fishermen and unfavourable weather conditions threaten birds and nests at Yancheng in China. In addition, the only breeding sites at Yeongjong-do and Songdo in South Korea are threatened by city development and reclamation.